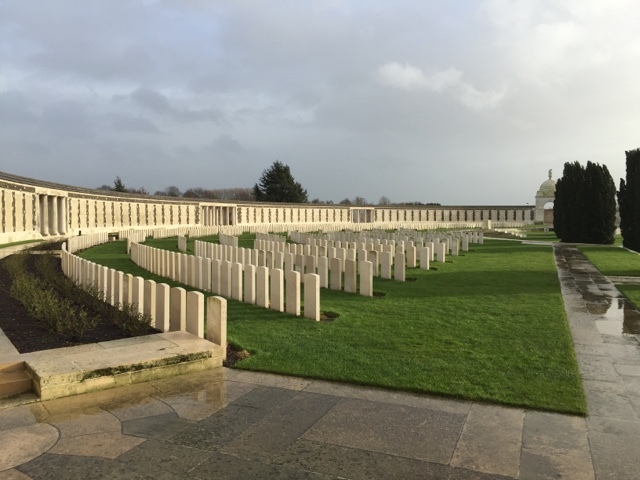 In an effort to escape carnival I took myself off with the Bears to visit Flanders and some of the First World War Battle Fields I had not visited before. 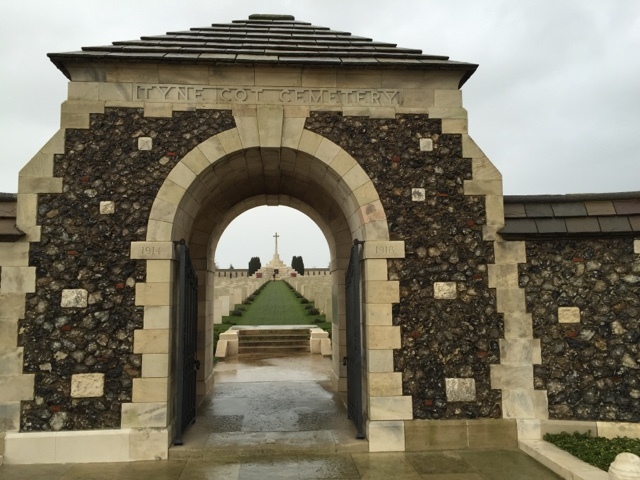 I had had the good fortune of visiting the Somme some years ago with my father and some of his Old Comrades. Now though I would be on my own. The drive on Monday, the day of all the carnival processions in the Rhineland, was easy enough though the wind blew hard. So hard in places that some of the carnival processions were cancelled, which was sad for them. 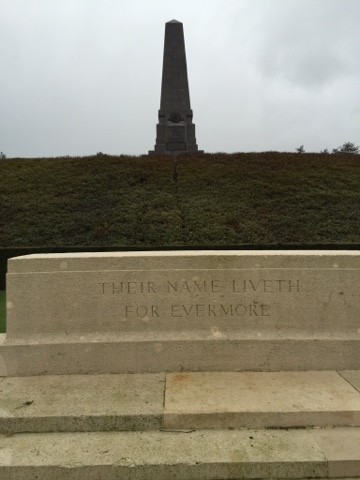 Somehow though, I thought the wind and rain appropriate for visiting the Battlefields. 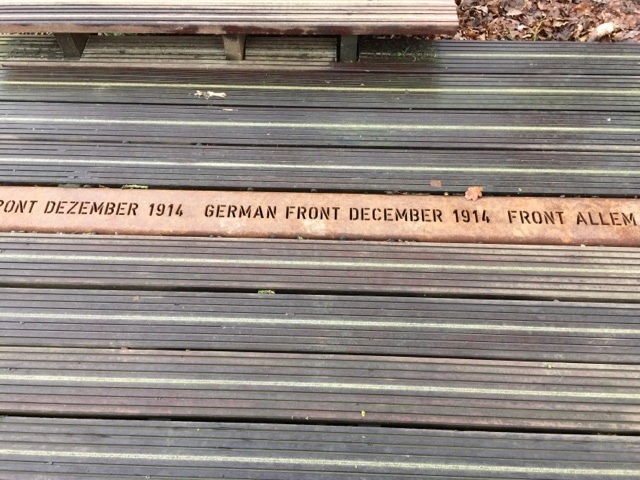 Just outside Ypres I stopped first to visit Polygon Wood where the Australians had fought. 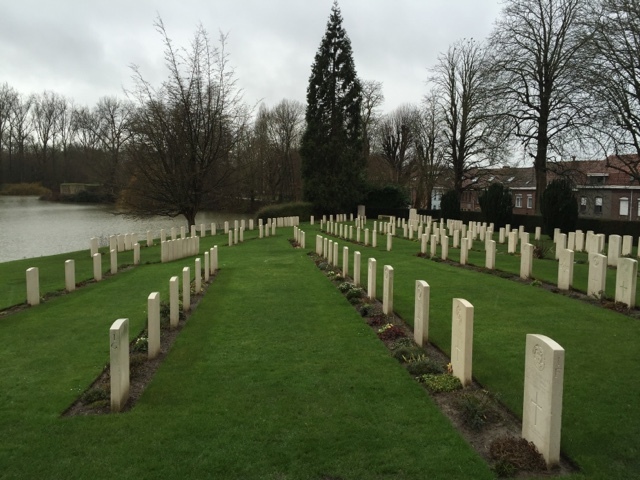 "We can truly say that the whole circuit of the Earth is girdled with the graves of our dead. 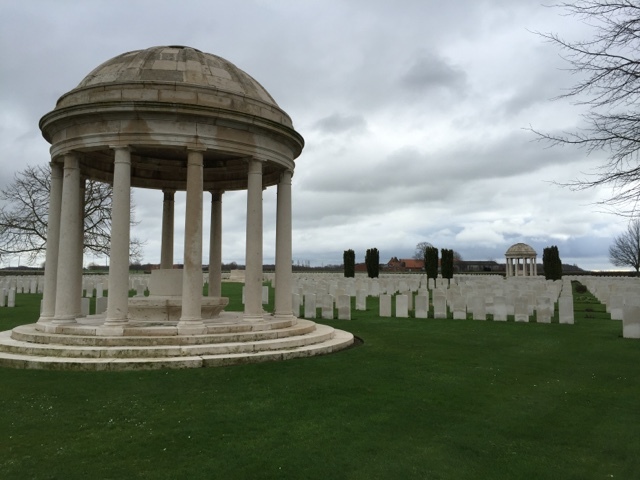 In the course of my pilgrimage, I have many times asked myself whether there can be more potent advocates of peace upon Earth through the years to come, than this massed multitude of silent witnesses to the desolation of war." A soldier of my regiment! 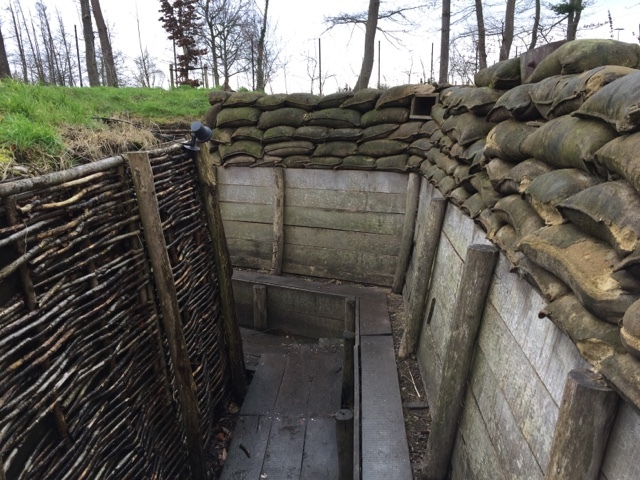 To get a good idea of what it was like in the trenches at that time a visit to the Flanders Museum in Zonnebeke is essential. 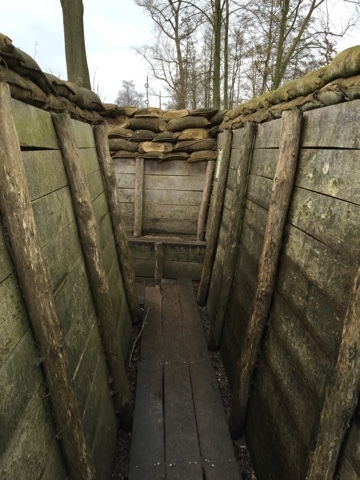 An eye level view from a fire trench. 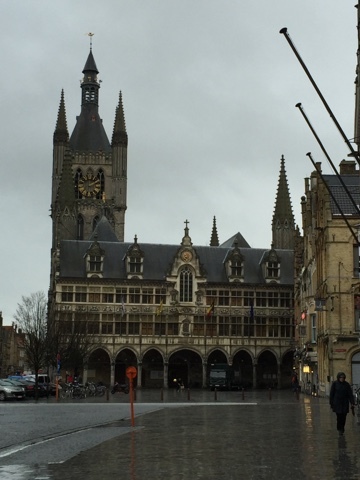 By this time I was cold and wet and in need of refreshment so headed for my hotel in Ypres. 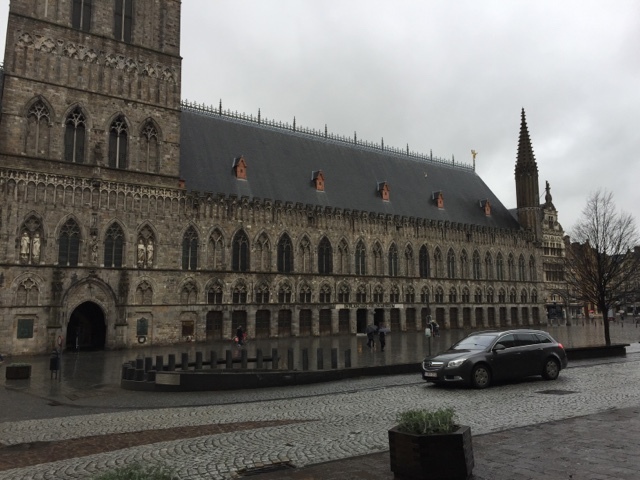 This was located in the Grote Markt. The views from my window. 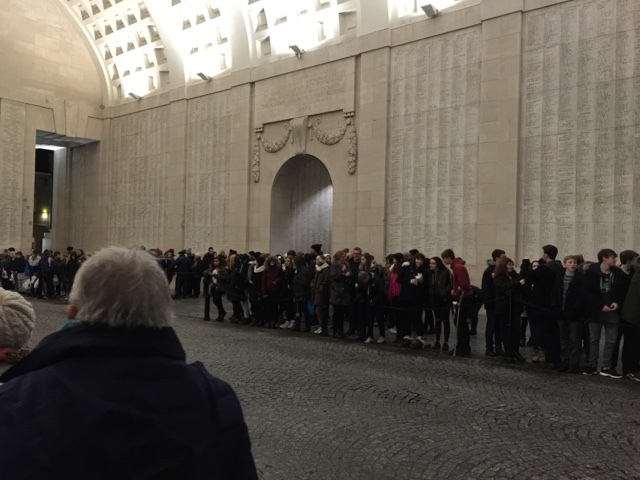 After my meal I went to visit the Menin Gate to witness the Last Post ceremony, but didn't stand in the right place, as I thought they would parade in the middle of it and not at one end. 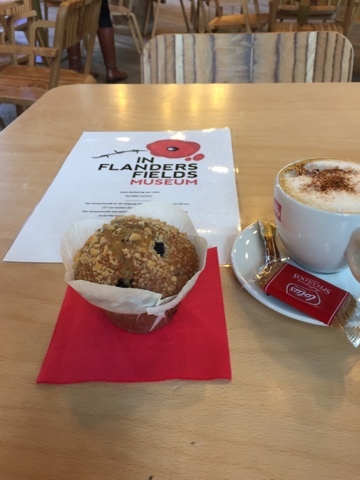 The next morning the weather was wet and windy, so I spent the morning in the very good Flanders Fields Museum in the centre of town just a few doors down from where I was staying. 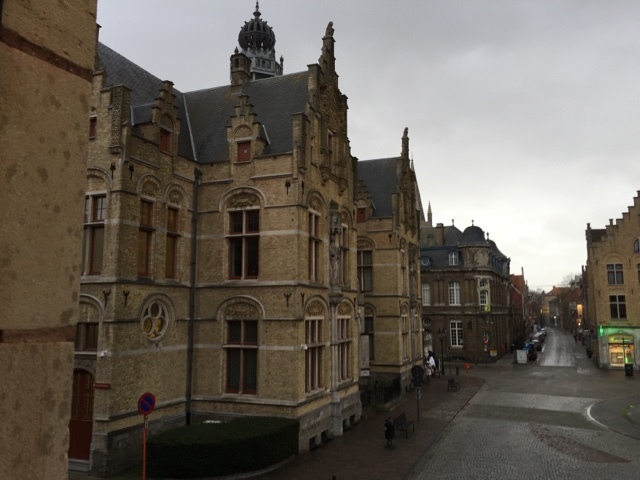 Then despite the weather I walked round the walls of the old town from the Menin Gate. Part of this trip was also to see how I got on using only my new iPhone as a camera. I was not enamoured and will still take my point and shoot LUMIX. 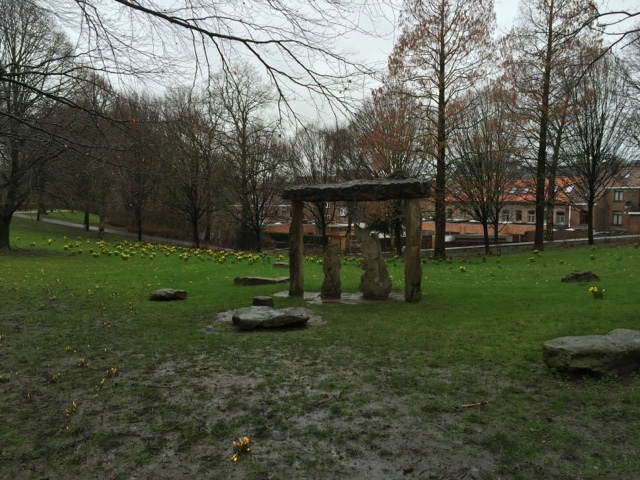 There were times when in the cold and rain it did not want to play. 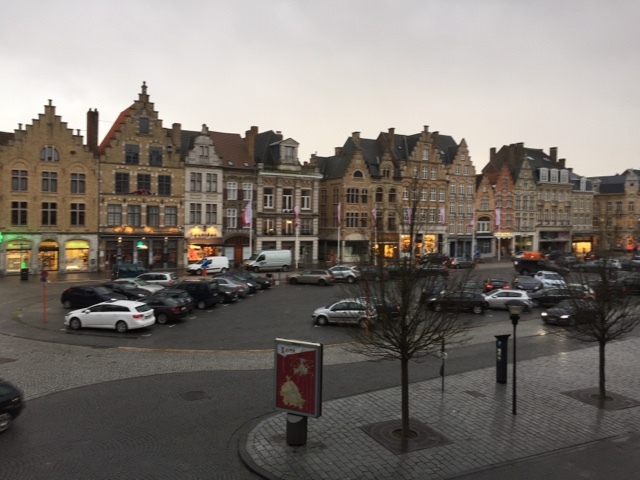 The red bricked building with the white doors is my hotel. 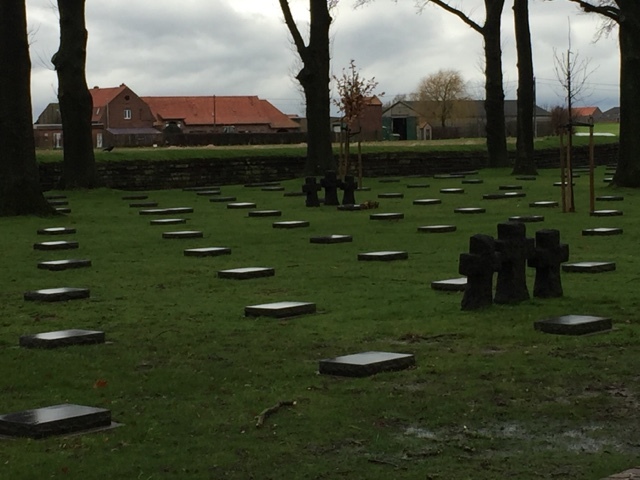 I now got in the car and drove to Langemark, which is the German cemetery. 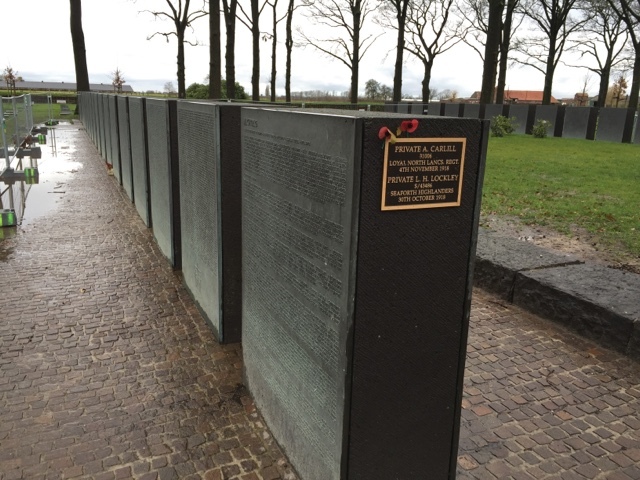 There are mass graves here and these stones carry the names of the many thousands on each side. 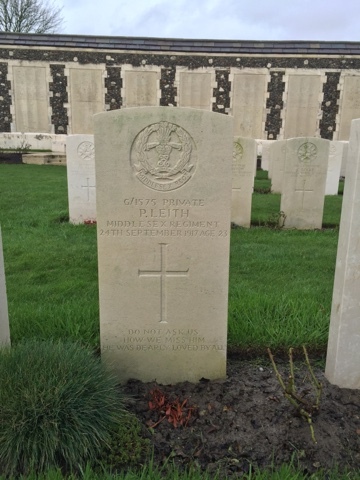 A couple of Brits are buried there too which the gold lettering on the side shows. 44,061 souls lie in this place! 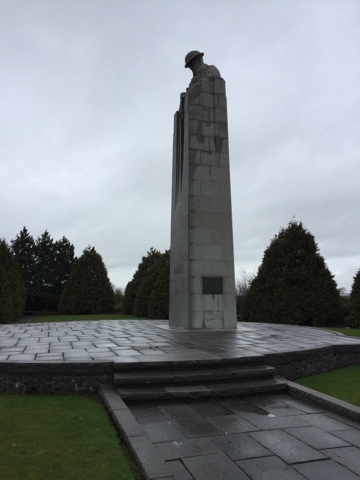 Not far from here is the memorial to the Canadians who suffered the first ever gas attack of the war. 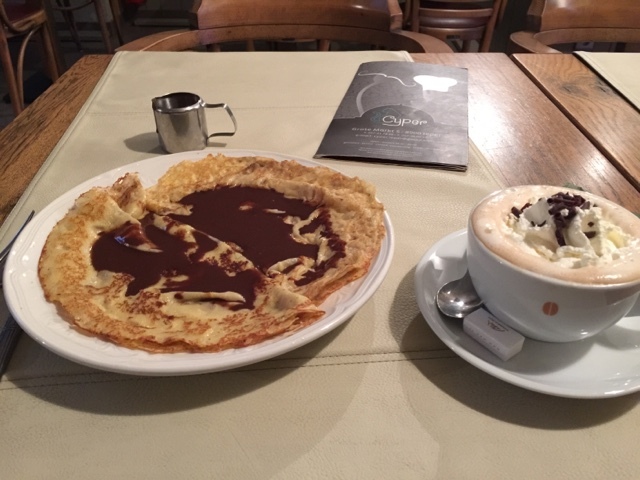 I was in need of sustenance after this and as it was Shrove Tuesday crepes seemed in order with lots of chocolate! 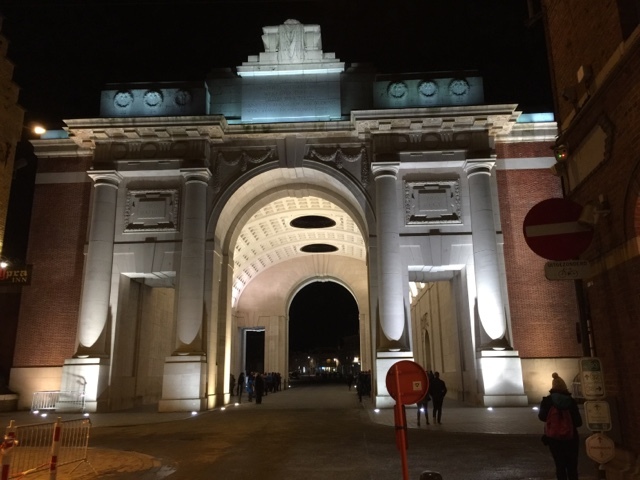 After dinner I returned to the Menin Gate. 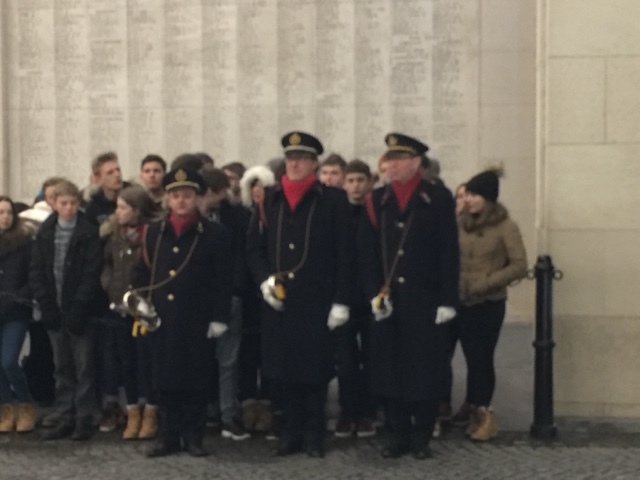 Sadly the video of the Last Post is too big to post on the blog. I still get goose bumps every time I hear it though. 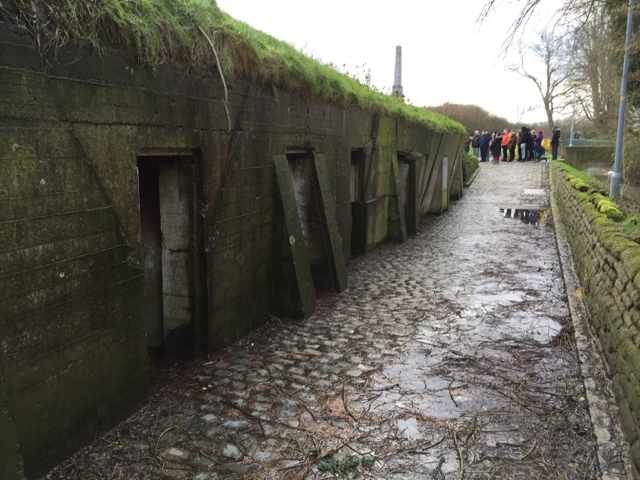 The next morning I went to the Essex Farm Cemetery. 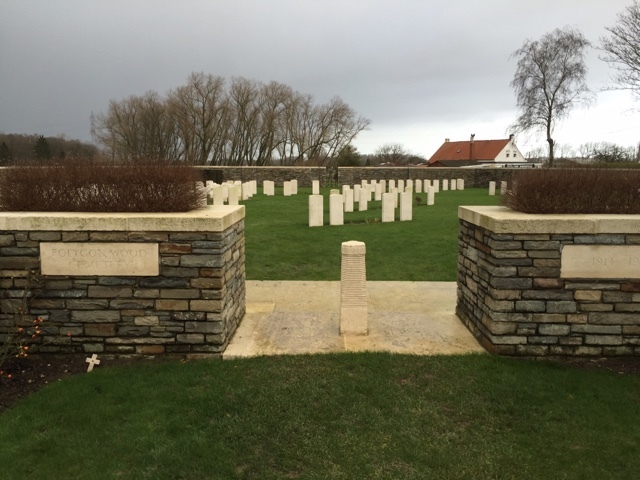 This cemetery is located on the front line right up against the canal. 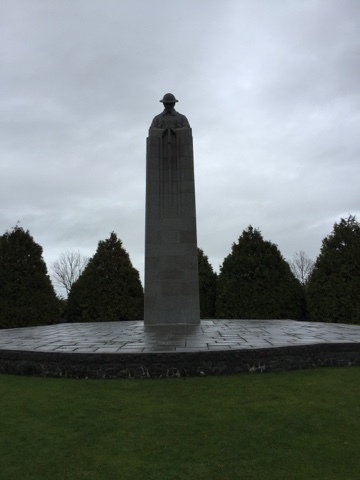 In the concrete bunkers located there the dressing stations were located and in one of them John Mccrae wrote his famous poem "In Flanders Fields." 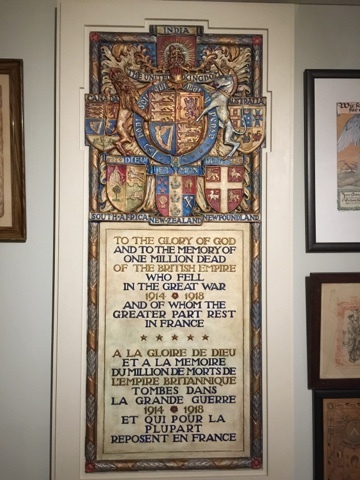 Sadly this famous Canadian died in 1918 from a combination of pneumonia and meningitis. 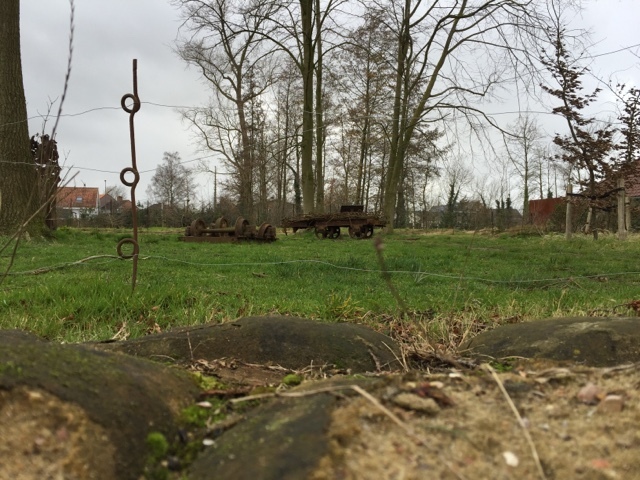 Hill 60 was a man made hill from the excavated soil of a railway cutting dominated an otherwise flat landscape. 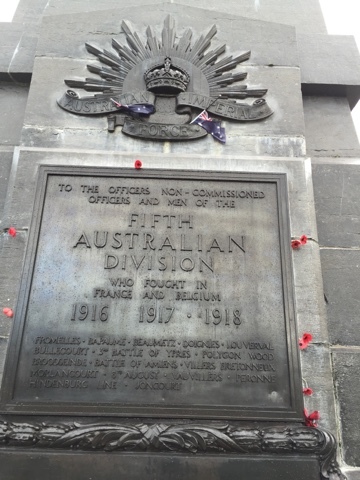 It was here that an Australian Tunnelling Company dug under the German lines and exploded mines before storming the summit. 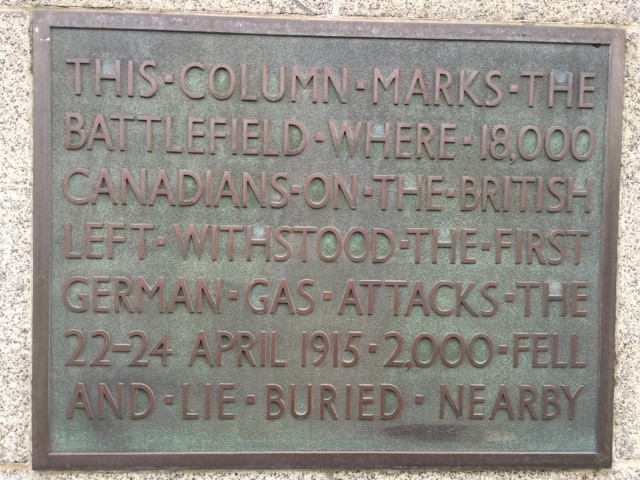 The Germans retook the hill following the use of gas. 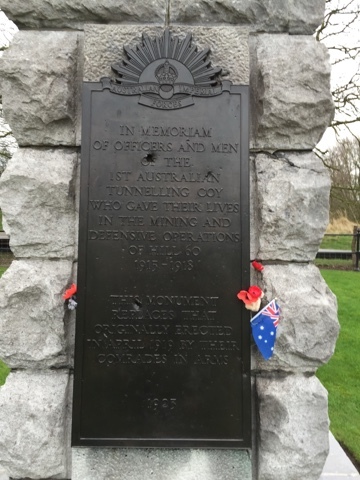 The Australians dug longer and deeper tunnels and exploded yet more mines. 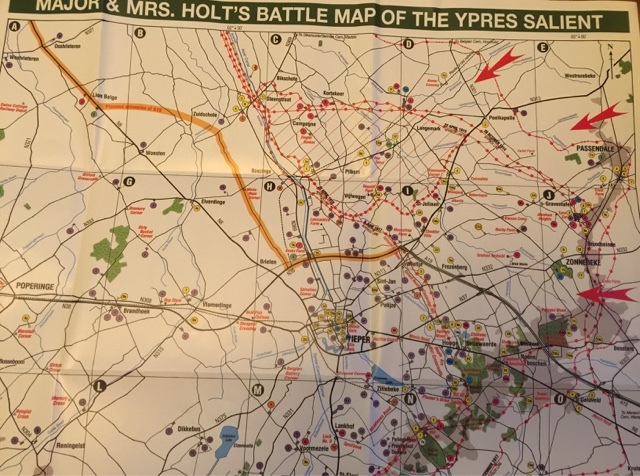 By the time the war ended the hill had changed hands at least seven times. 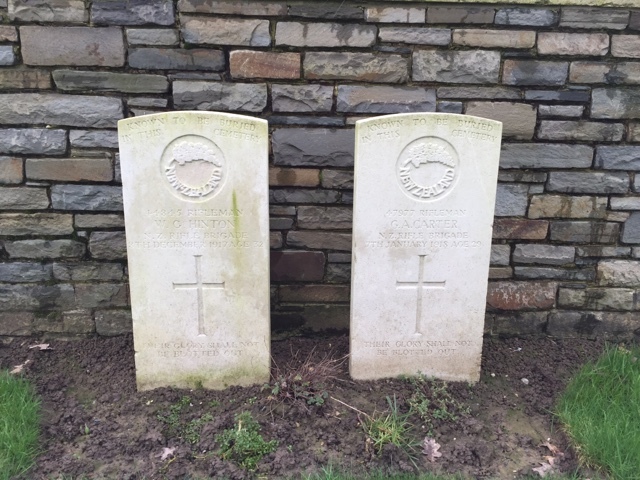 These two Front lines on Hill 60 were only about 25 metres apart!! I moved on to Bedford House Cemetery now. 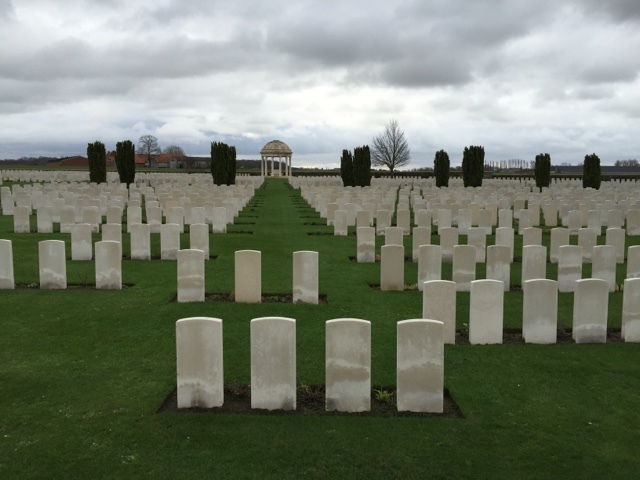 This is one of the largest Commonwealth cemeteries. 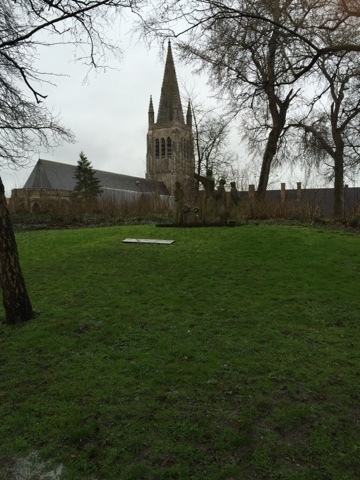 A castle had once stood here, but the shelling had destroyed it all. There are white limestone pavilions on the spot where the castle's own pavilions had stood, which give the whole a park like appearance. 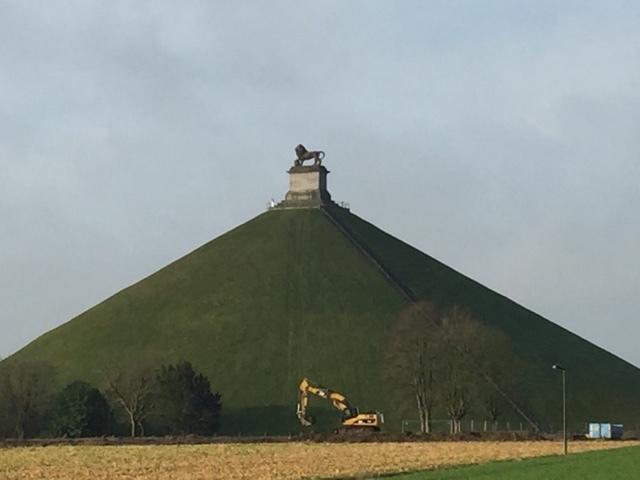 It was time now to put the First World War behind me and to go back further in time to Waterloo. 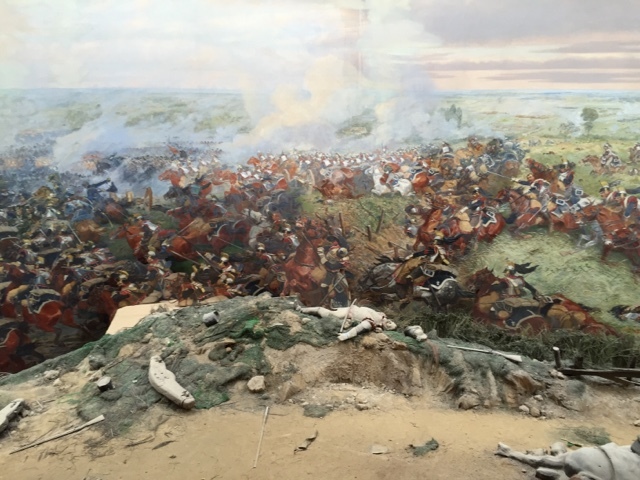 The battle of Waterloo in June 1815 was a turning point in the history of Europe. 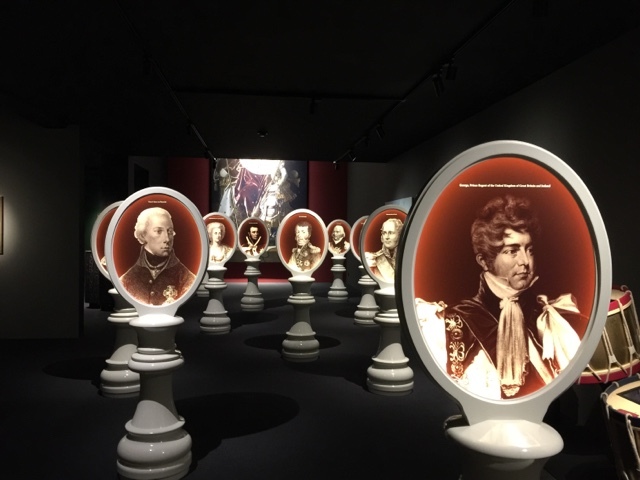 The latter half of the 18th century had been dominated by wars for supremacy between Britain and France. In the Seven Years War Britain drove France out of North America. The French though had their revenge when the American Revolution took place by allying itself with George Washington and driving the British out of what became the USA. 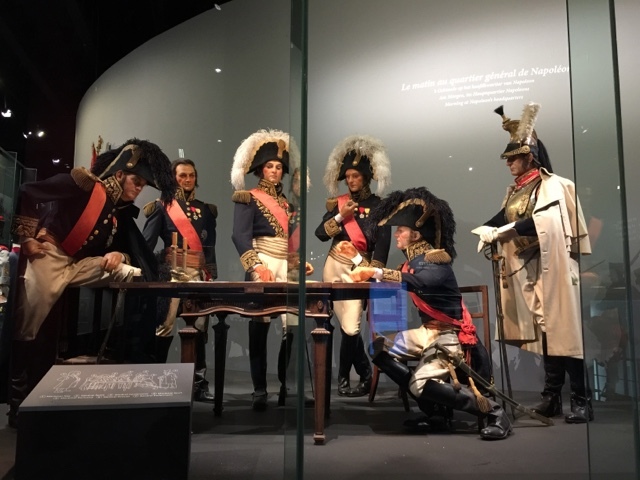 Ten years later the Revolutionary Wars in France began and except for 1802 they lasted until 1815. 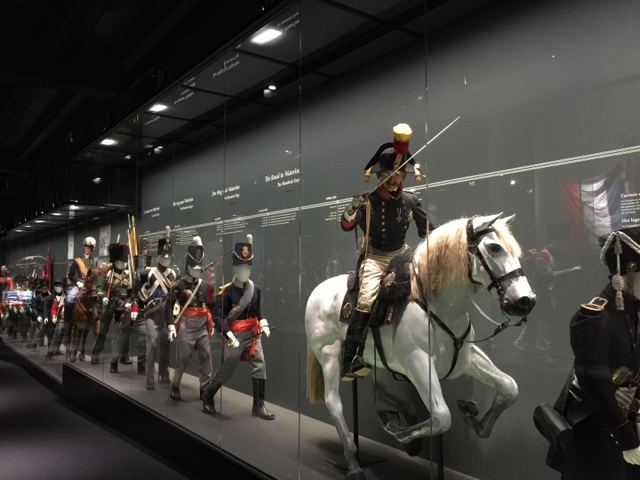 Waterloo ended the struggle and made Britain the dominant power of the 19th century. The Lion hill and monument dominate the landscape today. 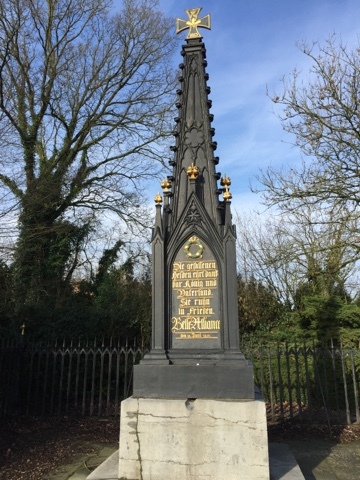 It was erected between 1824 and 1826 on the orders of William I of the Netherlands to commemorate the battle and to mark the spot where Prince William of Orange had been wounded. 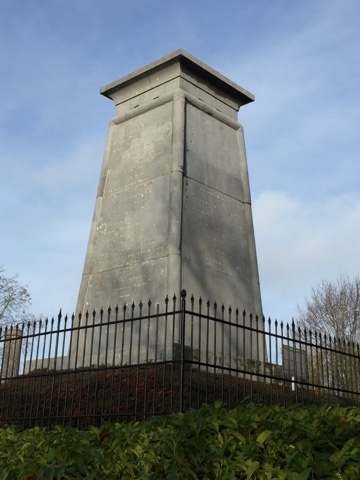 Access to this monument is through the new underground museum opened in 2015 to mark the 200th anniversary. 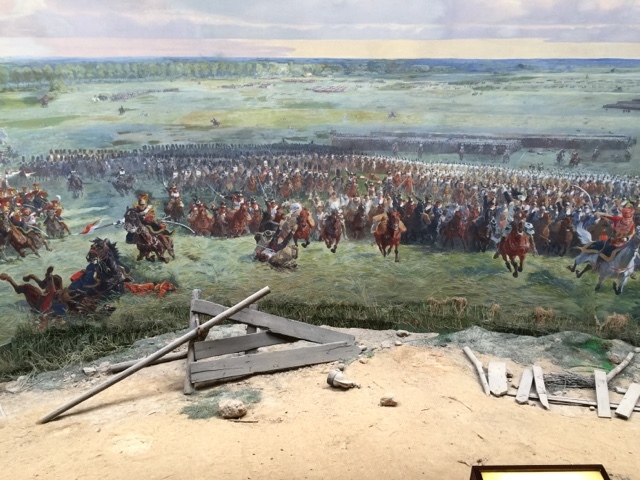 The many exhibits include a panorama of the battle. Like many battles it was a close run thing and hinges upon many factors. 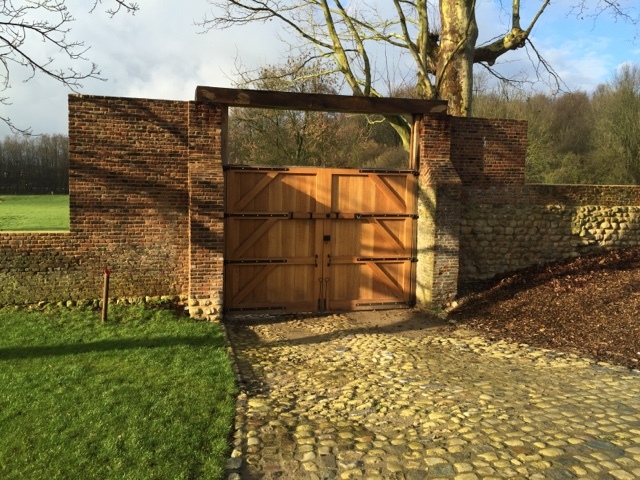 One of which was that the right flank of the British-Dutch Army under Wellington had to hold at Hougoumont farm. 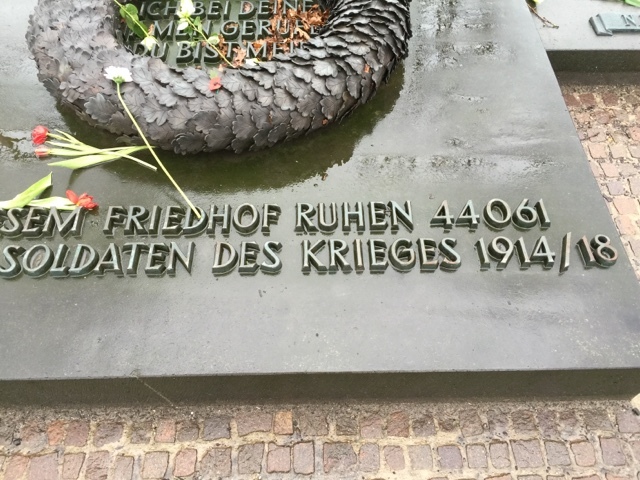 This was done by two regiments of the brigade of Guards and a battalion of the King's German Legion. 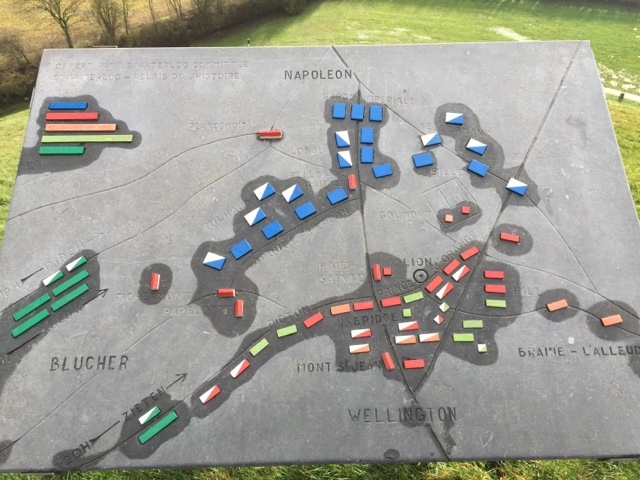 I took the shuttle bus to Hougoumont where they have an excellent film and light show depicting the battle that took place there. 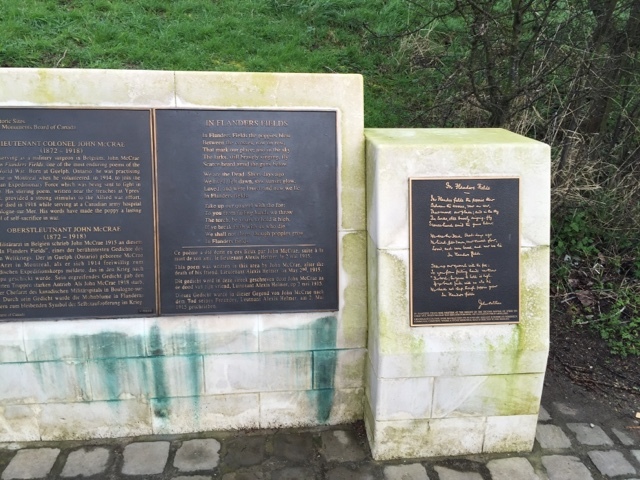 This memorial erected for the 200th anniversary shows the closing of the gates. 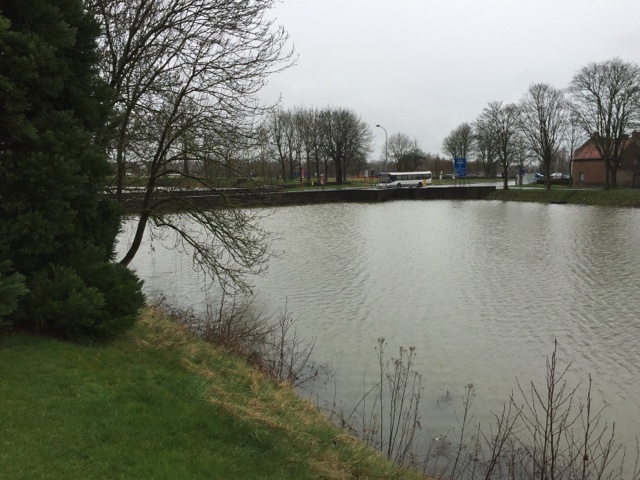 The Farm was defended by some 6000 Anglo-Dutch infantry and attacked all day by around 13000 French. 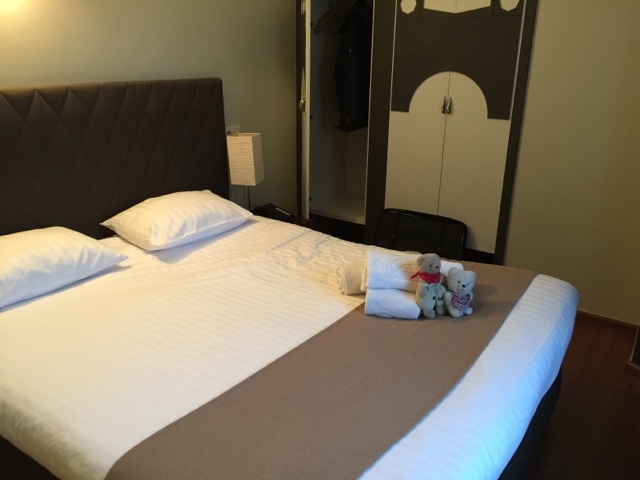 My hotel was close by the Lion Hill on Route du Lion and I was given the Blücher Room! 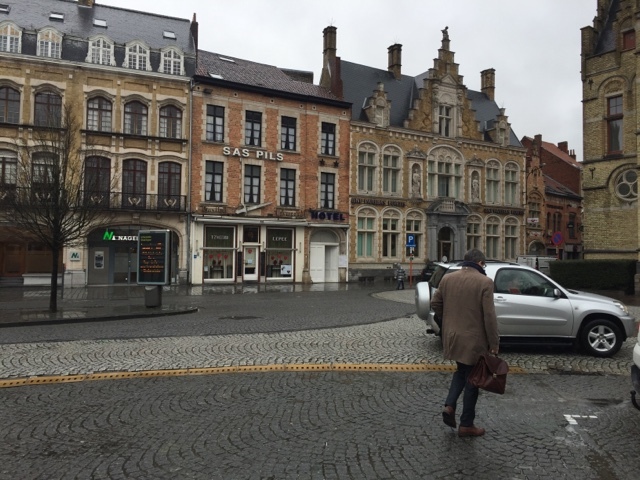 The meal in the restaurant that evening was first class and I can recommend the Hotel 1815 on Route du Lion to you for a visit to Waterloo. 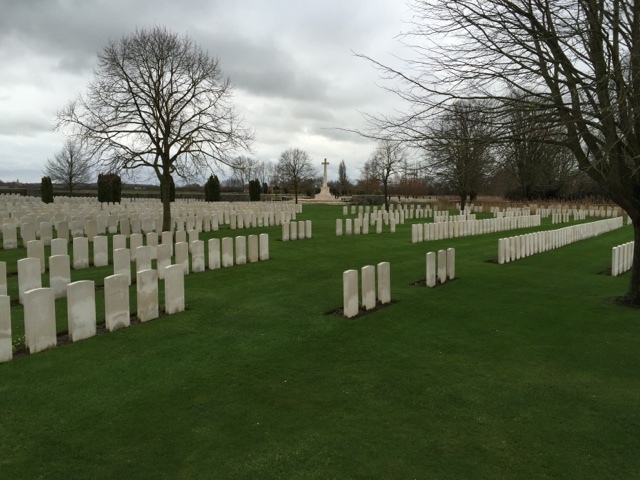 The next morning I went off round the battle field to look at the various places where action had taken place. 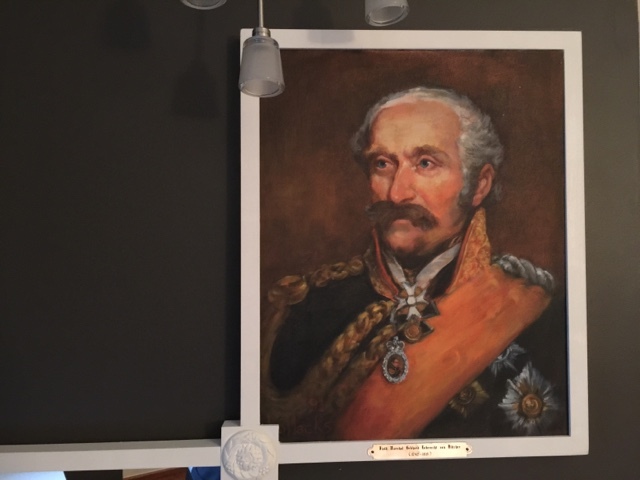 Many years ago when researching my family tree I had discovered a German ancestor who's death certificate states that he died at Waterloo on 18 June 1815! 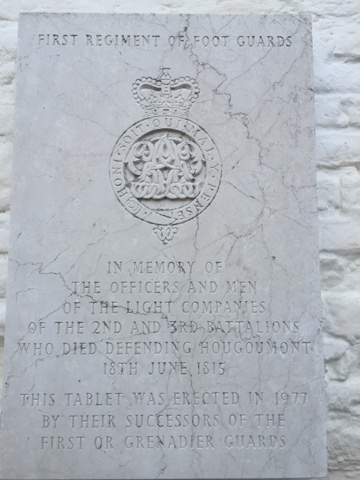 I have never been able to find in which regiment he served, but if he died at Waterloo then it could only have been either in Hougoumont, or the other Farm La Haie Sainte. 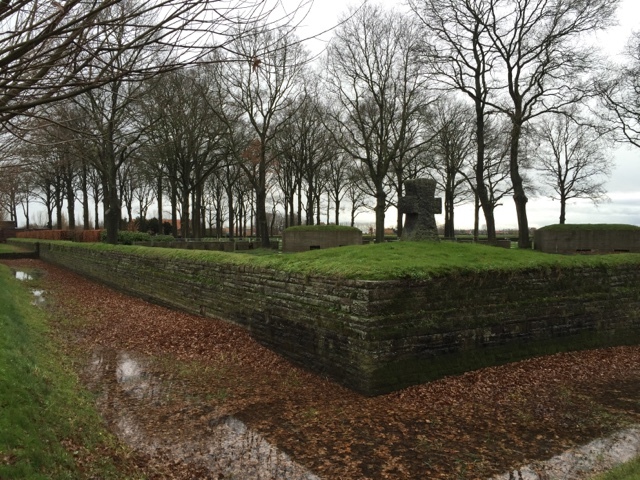 This is the monument, near Le Haie Saint Farm, commemorating the King's German Legion. 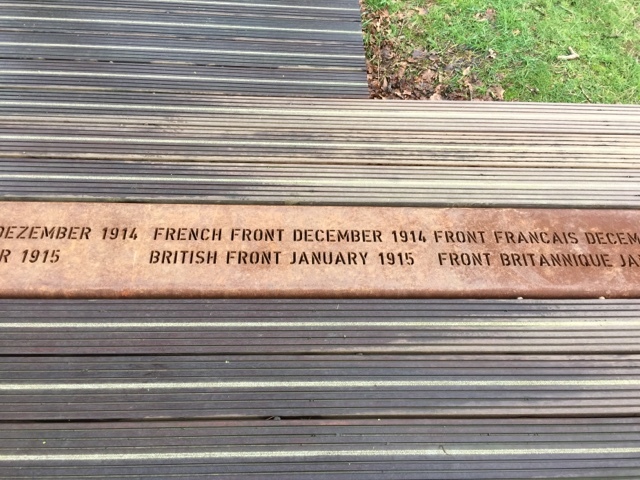 It is also the site of a mass grave. 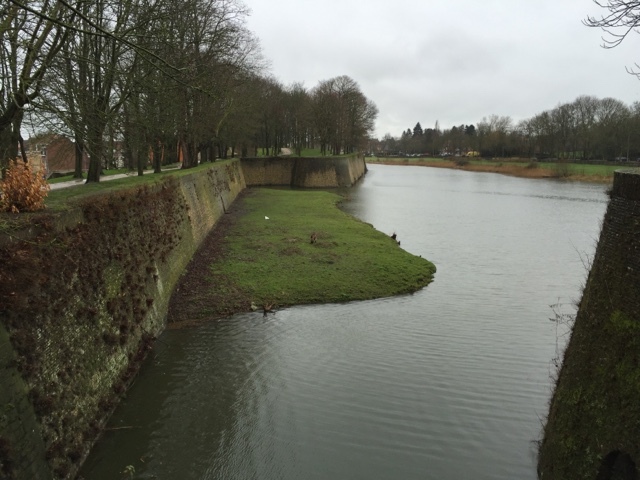 Is this where my ancestor lies? 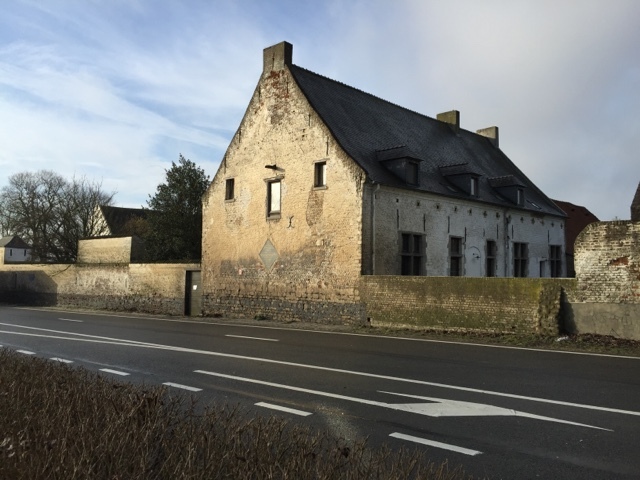 The farm Le Haie Saint which the French finally took at around 1800hrs. 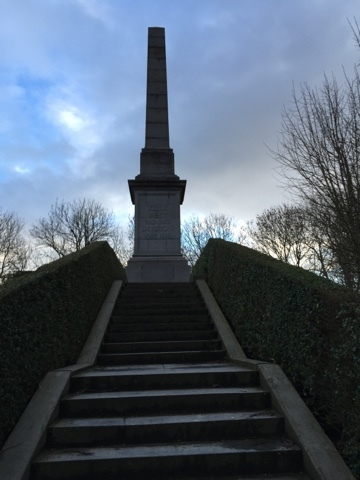 The Prussian Monument in Placenoit is erected on the site of where a French artillery battery tried to stop the German advance. 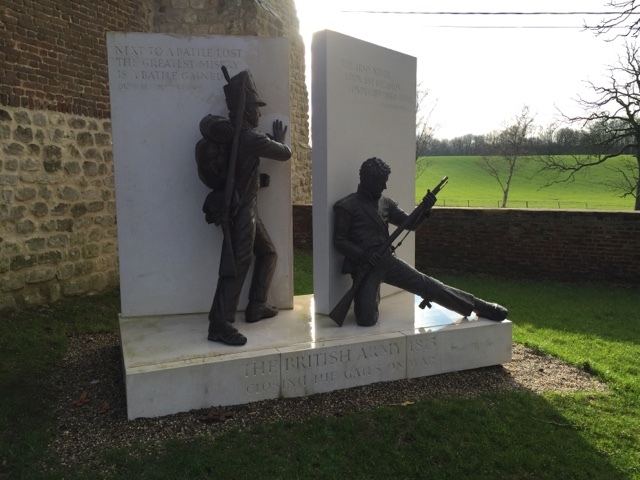 There are many more monuments around the various places on the battlefield where action took place. 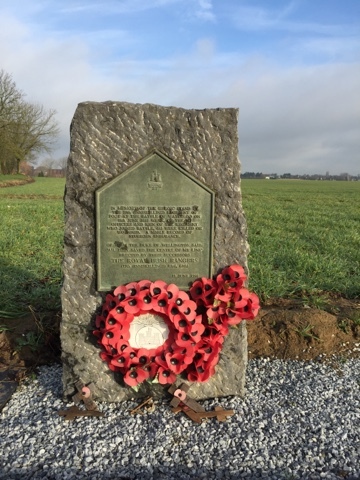 Here is one to the 27th (Inniskilling) Regiment of Foot which lost 66% of its strength in defence of the Anglo-Dutch Line. It is nice to see that homage is still paid here. 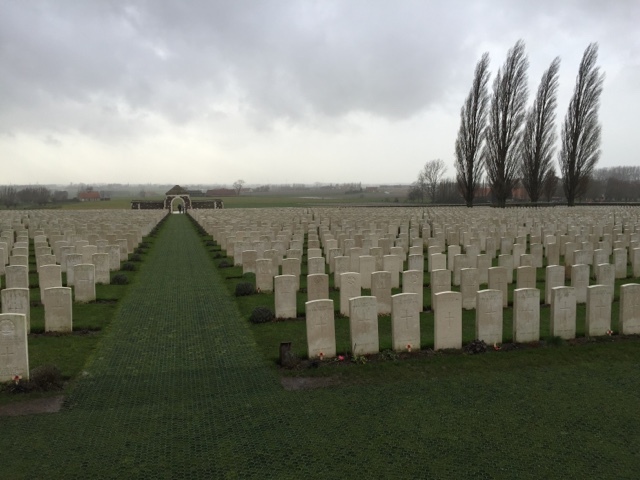 Around 10000 soldiers were killed here and some 30000 wounded. Another war to end wars? It certainly ended 23 years continuous war in Europe, but only for a short time. Did we learn from it? Not really since wars continued on European soil all through the 19th century and into the 20th! 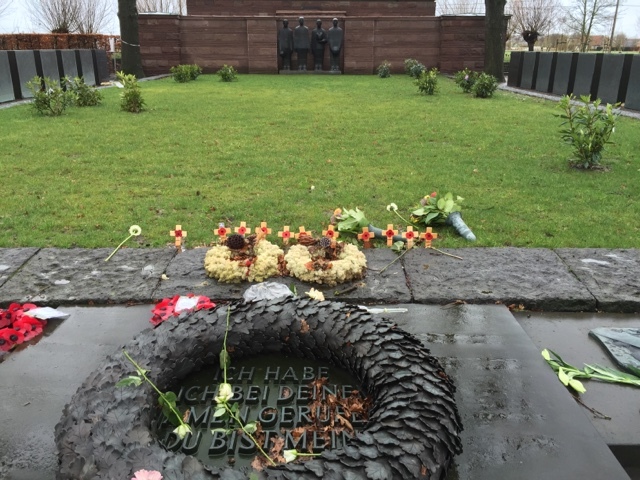 Germany in particular is traumatised by war and is why it favours such strong European ties. It believes that these ties have kept her safe for the last 71 years. The longest period of peace since time began! Long may it continue.